Education for Ministry: Is it for you? ent invites us to ask ourselves: Where have I gotten trapped in ways of thinking and acting that are not faithful to God’s love? What changes can I make in my life so that my actions are more in tune with Jesus’ mission of mercy, compassion, and hope? roll-out. We are test pilots for new technology that will enable your family and your congregation to track and reduce carbon emissions. Sustain Island Home will eventually reach across the whole Episcopal Church, and our diocese is honored to be part of the initial roll-out. We know that the Earth is crying out for justice and healing. Climate change is already taking a toll around the world and right here at home. So this Lent I invite you to join me in making a Creation Care pledge. I am grateful to the parishes that have already agreed to get started during this season of Lent. Our hope is that every congregation will consider joining this effort. If you like, you can jump right in and get started with Sustain Island Home, but we have also put together a team that can help you and your congregation to get started. Contact the team convener, the Rev. Eric Elley. He will arrange for someone on the team to help launch Sustain Island Home in your congregation. Create your profile It's easy to get started. Create your household profile and enter some information on your current activities so we can track your success! Take sustainable actions Browse a list of actions that will help reduce your impact, then add them to your dashboard. We'll help with next steps, costs, and questions. Work together When you create your account you will automatically be added to your local congregation group! Work together and help each other succeed! The Rev. Dr. Margaret Bullitt-Jonas, Missioner for Creation Care, can be reached at mbj@revivingcreation.org. Visit her website, RevivingCreation.org, for sermons and articles, and to sign up for blog posts and monthly newsletters. t’s been three months since Bishop Curry was here to inspire us, and revival events continue in local parishes and in corridors. The Steering Team is eager to hear what you have been doing to walk the way of love and how you have taken up the desire to be revived. Would you like to do things at a regional level, or two parishes together, or one parish? We are celebrating and giving thanks for some things that are emerging in different areas of the diocese: •	The Bible Challenge will reach 365 days on the Monday after Pentecost •	Lectio Group using The Way of Love Curriculum •	Way of Love Lenten Series •	40 Days of Love and Kindness Challenge •	Corridor Outreach Event — Parish outreach teams will gather to share their outreach ministries experiences, discuss opportunities to work together on outreach ministries. •	Corridor Outreach Event — Parish outreach teams will gather to share their outreach ministries experiences, discuss opportunities to work together on outreach ministries. •	Pentecost Day of Service Project Event — Packing meals for the organization “Stop Hunger Now”. •	Corridor Vestries Gathering — Share ideas of being a welcoming, inclusive, and engaged parish. •	Scott Bailey has accepted the position as the Chair for the Pioneer Valley Revival Year 2 Committee. You may have read Scott’s article in the September Abundant Times, “A Liturgical Approach to Revival,” a guide to relating the Revival theme to the liturgical calendar, from fall to spring. Scott and his committee will be reaching out to you shortly. our freedoms, including our cherished freedom of religion, is too often under-appreciated and is deserving of our active respect and support, especially in these dangerous times.” (Full text of Hambley’s address follows.) The second addition was the establishment of The Bishop’s Award. With this award, our diocese will highlight a local journalist of any medium who demonstrates excellence in bringing local and national concerns to the people of Western Massachusetts. Our first recipient, Carrie Saldo, is the Bishop Fisher and Lynn Page. host of WGBY’s Connecting Point, a Photo: Episcopal WMA ▲ news magazine program rooted in local subject matter, from politics to the The date for the Blessing of Journalists was selected in conjunction with the arts, that airs weeknights at 7:00 PM. Episcopal Church’s annual commemoration of Frederick Douglass “Carrie takes on the local issues that (1811-1895) — abolitionist, orator, and affect our community,” Bishop Fisher editor of the pro-abolition journal The remarked. “She also facilitates a weekly conversation about ‘The State North Star. Douglass was a prophetic witness to the sinfulness of slavery and We’re In’ — an in-depth discussion with our government leaders. Carrie’s spoke this truth to a nation in need of repentance and reform. In a speech body of work for PBS and NPR has before the American Anti-Slavery Somade her a well-respected journalist ciety, May 11, 1847, Douglass spoke and a trusted voice here in Western Massachusetts. Carrie Saldo is a bless- of the need for unrelenting assault on the institution of slavery: ing and we bless her in return.” Saldo was unable to accept the award in person. Her baby arrived early — and healthy. Lynn Page, WGBY’s Deputy General Manager, accepted the award on Saldo’s behalf and read a message from Saldo to the assembly. ne of the principal focuses of today’s service must necessarily be on praying for the protection and safety of journalists — a topic which we should never have had to raise, especially in the United States. This is largely because of the traditionally high regard we have shown for the Fourth Estate, or fourth power, which refers to the press and news media, both in their explicit capacity of advocacy and their implicit ability to frame political issues for consideration by the public. Unfortunately, times have changed. It used to be that on battle fields, journalists wearing identification on their clothing similar to those worn by Red Cross and Red Crescent workers were largely immune from deliberate targeting for murder. Sadly, in recent conflicts in the Middle East, the opposite has become the norm. Even in the Iraq war, U.S. forces were not immune from criticism in this regard. a short, 40 minute drive to the west of this cathedral, as our Bishop can attest. My second concern is for the safety and well-being of all journalists and the urgent need to find an effective mechanism to end impunity for those responsible for journalists’ deaths. They are literally “getting away with murder.” My third concern is really the bull in the proverbial china shop: fake news and the deliberate dissemination of non-truths and misleading facts, especially in social media outlets like Twitter, Google, and Facebook, but also on WhatsApp, and local newspapers and television. And we pray for civility in our public discourse, for our ability to rise above surface differences and set aside personal agendas and bias, and we ask for God’s grace to seek the undivided truth — that truth has nothing to fear, that all will be revealed in the light, and that every story is a story of God’s creation, worthy of being shared. In your mercy, People: Hear our prayer. Jamal writes: As a result, Arabs living in these countries are either uninformed or misinformed. They are unable to adequately address, much less to publicly discuss, matters that affect their region, and their day-to-day lives. A state-run narrative dominates the public psyche, and while many do not believe it, a large majority of the population falls victim to this false narrative. The Freedom House report cited by Jamal makes for a dismal read in cataloguing the downward spiral of freedom around the world in 2017, generally, and in press freedom, particularly. two-thirds of the Saudi population of 28 million people is under 30 years of age. In the U.S., less than 40% is under 30. Not surprisingly, the United States and President Trump are sharply criticized. The president, according to Freedom House “…lambasted the media — including sharp jabs at individual journalists — for challenging his routinely false statements.” And that was in the report covering 2017. It did not catalogue continuing outrages against the U.S. press, including the November 2018 embarrassing encounter at the White House briefing session involving CNN’s Jim Acosta. Journalist Safety and Establishing a More Effective Means to Ending Impunity for Those Responsible for Their Deaths My second concern is two-fold. Firstly, to promote the safety and wellbeing for journalists, on every platform and from every nationality, and secondly, to demand an effective mechanism to end impunity for those responsible for their murder. a Time Woman of the Year, was indicted a second time earlier this month and arrested last Wednesday. Ressa, founder and editor of the online news outlet Rappler, now faces “cyber libel” charges over a 2012 article. among people world-wide — have and are being used by persons, organizations, and governments of illintent to promote political agendas, ruin reputations, and, in some instances, attempt to bring down governments or influence local elections. Late last year, she was hit with tax evasion charges. Ressa’s work has criticized Philippines President Rodrigo Duterte and his brutal war on drugs, so the charges filed against her have been condemned by rights groups as a blatant attempt to stifle her specifically and press freedoms in the Philippines more generally. The proliferation of use of these and other social media outlets over the past decade has been truly phenomenal; the challenge they collectively pose for media freedom and freedom of expression more broadly is equally formidable. According to the Committee to Protect Journalists (CPJ), over the past decade, in addition to literally scores killed in war zones, 327 journalists have been silenced by murder. Think of this number — 327. In fact, in the press freedom index published annually by Reporters without Borders, the Philippines is listed at 133 out of the 180 countries surveyed as lacking in press freedom. China is rated at 176 out of 180 countries, while, in contrast, Norway is number 1, Canada at number 18, and the USA is at number 45 and slipping. North Korea is listed at the bottom with 180.
case they were shut down. Most people received their benefits for February on January 18th, rather than February 3rd to 5th. Unfortunately, not everyone understood that this was the February payment, and some treated it as an unexpected windfall. For some people, the letter explaining the change did not arrive until as late as January 24th. Even those who got the news were faced with making four weeks of benefits last almost seven, assuming that the shutdown ended before the March distribution date. To donate online, go to www.diocesewma.org/givingopportunities/ and scroll down to Walking Together. n 2015, a rector and a senior warden had a dawning. The Holy Spirit was alive and active in their church community, inspiring and enlivening people to serve in new and exciting ways. New ministry teams and projects were popping up everywhere. How wonderful… except the rector and senior warden found themselves integrally woven into the leadership of each and every initiative. It didn’t take too long for them to realize that having just a few leaders to run everything was not a sustainable way to raise up ministries or to empower people to use their God-given gifts for service. So Fr. Peter Swarr (the rector) and Susan Schneider (the senior warden) set out to offer a program that would identify and support new leaders within their church. They felt called to offer a program that would not only explore the basics of Christian leadership but would also create a caring faith community where individuals would be fed spiritually as they discerned God’s call... and, of course, it had to be fun! Hard as they tried, they could not find a program that fit the call they had received. So they created one. Exploration into Christian Leadership Program Overview God has gifted each of us with various skills and abilities that are meant to be used in service to God and others, and the gift of leadership is no exception. Over the course of five evening meetings and a weekend retreat, we explore the various aspects of Christian leadership within the church setting. Because no one can be Christian alone, this journey is done in community. Each church needs to be committed to raising up leaders who recognize and honor Christ in every person so that in every ministry and every activity, we might be faithful to God’s call. new ways. Courses have taken place throughout the Pioneer Valley and retreats have been held in Leyden, MA and West Cornwall, CT.
•	Gain tools, skills, and insights in worship and leadership so that they feel competent, ready, and equipped to respond to God and serve in whatever way they are called. •	Engage in activities that allow them to try out different forms of leadership in a hands-on way so that when it is time to discern their call, they will have personal experiences on which to reflect. •	Develop a community of learning with fellow Christians so that, through prayer, conversation, and discernment, they may understand and follow in the ways God is calling each one of them. •	Recognize that they are beloved of God, endowed with gifts and talents which they are called to use to serve God and others. To learn more about the Exploration into Christian Leadership Program, check them out on Facebook @ExplorationIntoChristianLeadership or email ExploreChristianLeadership@gmail.com. s lay people, we face the difficult and often subtle task of interpreting the richness of the church’s faith in a complex and confusing world. We need a theological education which supports our faith and also teaches us to express that faith in day-to-day events. EfM helps empower us to be well-informed and knowledgeable lay people. after returning from Tanzania, where I served as a missionary from 1984– 1986. At that time, Bishop Andrew Wissemann helped me discern my next step in ministry by offering to pay for half of my first year of EfM. Over the years, as a student and then as a mentor, I have found that the program has strengthened my Christian commitment as well as enhanced my walk with Jesus. At the end of the Eucharist we all pray, “And now, Father, send us out to do the work you have given us to do, to love and serve you as faithful witnesses of Christ our Lord.” EfM has helped empower me to be that faithful witness, enabling me to do the work He has given me, whether as a missionary for six more years in Tanzania, or as a eucharistic Minister, Lay Preacher, and EfM mentor here in Western Massachusetts. I invite you to join us; if there is not an EfM group meeting near you, I will help to get one started. Please give it some prayerful consideration. It may be just what you need to discern and answer Jesus’ call to you. ♦ Peter can be reached at ppletitbe@ gmail.com. such, and also for sustenance. What was captured wasn’t simply a show of work, but a part of the creative expressions of a community. This certainly was not a banal moralistic art display that had as its primary reason for existing the question, “to what heights is this lifting you?” Everything spoke for itself, everything echoed in its own way something of The Creator. That is not always pleasant. The necessity of creating may often be because things are not seen as they should be, or reality is not the “dream that God has for it,” and so it is an act of anguish. As a James Baldwin fan, I’m reminded of what he said of art, and in his understanding, all art. He wrote, “All art is a kind of confession, more or less oblique. All artists, if they are to survive, are forced, at last, to tell the whole story; to vomit the anguish up.” Sunday after Sunday we worshiped with such diverse pieces of materiality around us. Somehow, and in some ways, they affected us, impacted us, made us think. They added to our experience; perhaps even, detracted, also fantastic. Some don’t realize what they love so much and why unless you tinker around with it for a while. For me, the most beautiful outcome was how much we learned about each other, and how much creative potential there is in our communities if we simply give it space. I would wager that you may have some empty space that could be filled with what you already have — those creative blessings that have already graced your thresholds. ♦ Photo: submitted. WMA's Newest Priest Ordination to the Priesthood Megan McDermott Our newest priest was ordained on Saturday, February 9, 2019 at Grace Episcopal Church in Amherst. Megan was formed for the ministry of priesthood by the Episcopal Diocese of Central Pennsylvania. She graduated in May from Yale Divinity School with a Master of Divinity degree, a diploma in Anglican Studies, and a certificate from Yale's Institute of Sacred Music. Megan was ordained to the transitional diaconate on August 4 by the Rt. Rev. Audrey C. Scanlan. She joyfully serves the people of Grace Episcopal Church in Amherst as curate. On the Way to Priesthood Ordination to the Transitional Diaconate Ann Scannell Ann Scannell was ordained to the transitional diaconate on Saturday, December 15, 2018 at All Saints Episcopal Church in Worcester. Ann discerned her call to priesthood with the people of St. Francis' Episcopal Church, Holden where she served on the vestry and as a Eucharistic Visitor. She is currently pursuing the Master of Divinity degree at Yale Divinity School/Berkeley Divinity School and will graduate in May of 2019. Ann currently serves as deaconin-charge at Good Shepherd, Clinton until she is ordained a priest in June, God willing and the people consenting, when sheâ&#x20AC;&#x2122;ll become priest-in-charge. New Appointments Gideon's Garden Gets New Supervisor Jen Bloesch Grace Church in the Southern Berkshires has hired Jen Bloesch as Agrarian Youth Mentor and Supervisor. Jen will work alongside the current Youth Supervisor to manage Gideon’s Garden. Gideon’s Garden has been operated, for the last ten years, by volunteers of Grace Church and Taft Farms on whose land the Garden is located. Having a full time AYMS will secure the future of Gideon’s Garden and allow the mission of Grace to expand into the community. Jen graduated from Boston University in May 2018 with a Master of Divinity degree. In her own words: “I have often dreamed of combining my love for Christian ministry with my love for food and for nature, and I cannot imagine anything I’d want to do more than offer a spiritual environment for young people in a garden.”Jen will be ordained in the United Church of Christ on May 4, 2019 in Newton, Massachusetts. United Thank Offering Leadership Change Under Susan Howland's stewardship, diocesan UTO ingatherings have grown and visibility for this churchwide ministry has increased. We're grateful to Susan for, in Bishop Fisher's words, "fourteen years of extraordinary service." Diane Nichols will assume UTO leadership in 2020. She serves as junior warden and the parish UTO coordinator at Holy Trinity, Southbridge. For the remainder of 2019, she will shadow Susan, who has served as diocesan UTO coordinator since 2004. We are grateful to Diane for her willingness to take on this important ministry. Susan will continue her ministry with ECW. She will leave a legacy of faithful service and good works at the UTO. Karen has served as diocesan archivist since 2010.
seven practices than to live 73 chapters. Trust me! While they may seem to be in a particular order, they are, in fact, a circuit. useful, I think we can go it alone, too. These seven practices are already part of our spiritual lives. For me they are becoming a helpful litmus test. •	TURN: What am I turning toward in my life? •	LEARN: When was the last time I read a book about Jesus? •	PRAY: What does being faithful to prayer look like these days? •	WORSHIP: How is the grace and mandatum of Sunday overflowing in the other six days of the week? •	BLESS: Who needs a blessing from me? Where does that urge to curse come from anyway? •	GO: Where in my community should I go next with the message of God’s love in Christ? •	REST: How can I schedule real rest from all work for the good of the order and the glory of God? 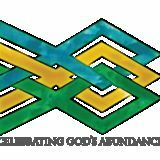 Donations for the cost of ABUNDANT Times are gratefully accepted. The cost per household per year is $10. Gifts can be mailed to Diocesan House at 37 Chestnut St., Springfield, MA 01103-1787. Address corrections or deletions may be sent to the same address attention: A. Gamache. 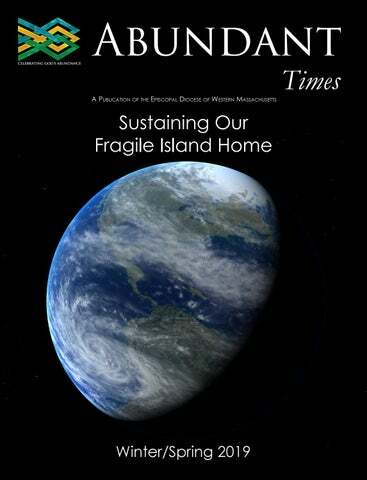 This issue of ABUNDANT TImes features a new church-wide project called, "Sustain Island Home."